Groundhog Club co-handler Al Dereume held Punxsutawney Phil Friday morning. PUNXSUTAWNEY, Pa. (AP) — Pennsylvania’s most famous groundhog foresees no early end to winter. The handlers of Punxsutawney Phil said the furry rodent has called for six more weeks of winter after seeing his shadow at dawn Friday. 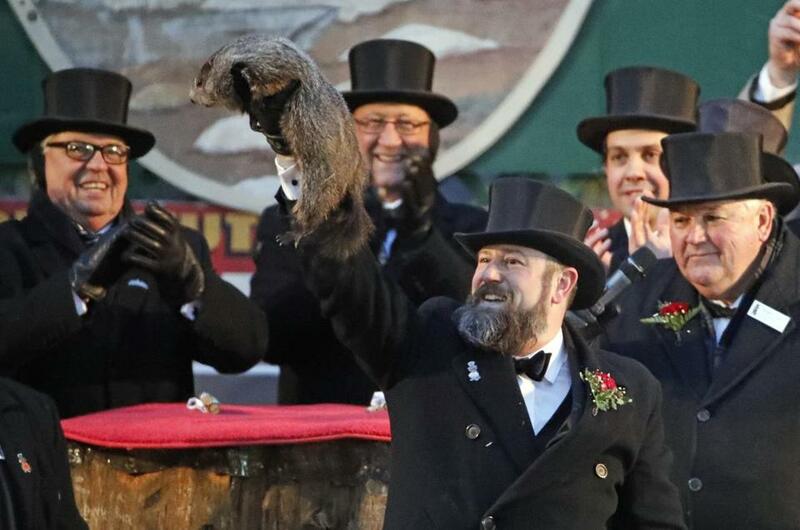 The top hat-wearing members of the Punxsutawney Groundhog Club’s Inner Circle reveal Phil’s forecast every Feb. 2. It is based on a German legend surrounding Candlemas. The legend says if a furry rodent casts a shadow that day, winter continues. If not, spring comes early. In reality, Phil’s prediction is decided ahead of time by the group on Gobbler’s Knob, a tiny hill just outside Punxsutawney about 65 miles (about 100 kilometers) northeast of Pittsburgh. Thousands of people gathered overnight to await the forecast, bundled up against the cold and entertained by folk music and a fireworks display, with temperatures around 11 degrees (minus-12 Celsius). The groundhog’s prediction is typically contained in a short poem. Records dating to 1887 show Phil has now predicted more winter 103 times while forecasting an early spring just 18 times — including last year. There are no records for the remaining years. At the Staten Island Zoo In New York, Staten Island Chuck had a difference of opinion with Phil. Chuck — a three-decade veteran of weather predictions — did not see his shadow. That means he’s predicting an early spring. New York Mayor Bill de Blasio skipped Friday’s ceremony, several years after dropping a groundhog that later died.